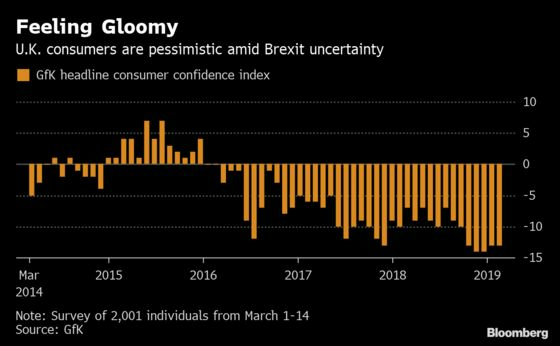 (Bloomberg) -- U.K. consumers remained gloomy this month as the political turmoil surrounding Brexit escalated. GfK’s headline confidence measure held at minus 13 in March, close to its lowest level since 2013. While households reported a slight increase in confidence over the general economic situation over the next year and in their own personal financial outlook, they were less likely to think now is the right time to make major purchases, a worrying sign for retailers. A separate survey by Lloyds showed a slight rebound in optimism among businesses after it plunged to a seven-year low last month. Of the 1,200 firms interviewed, 27 percent said they weren’t fully prepared for additional pressures on their working capital in the event of Brexit, compared to 62 percent that said they were. In a sign of how Brexit uncertainty has stalled spending plans for many firms, one fifth told Lloyds that they were holding back from refinancing debt and 28 percent plan to increase investment once they have more clarity.